The installation of Microsoft SQL server parts during eWay-CRM installation can show the window with this text: "Sorry, but installation failed. Microsoft SQL server installation returned this error: 1603". It cannot be installed the MSXML 6.0 Parser component during the SQL server installation. The MSXML 6.0 Parser component cannot be uninstalled from the Uninstall or change a program in Windows. 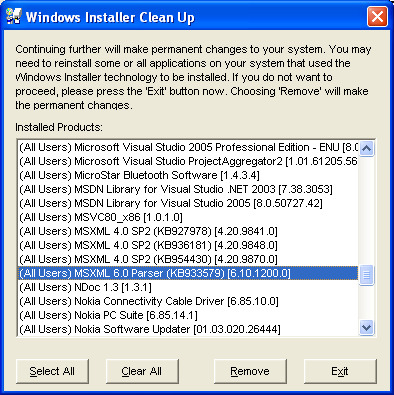 You have to install application called Windows Installer CleanUp. In the Windows Installer Clean Up, select the MSXML 6.0 Parser component and click the Remove button.